Collected and semi-edited by Rabbi Ari Kahn. This is an unfinished work in progress, much of the material was collected from other students of the Rov, or from tapes of shiurim. David Bedein and Samuel Sokol interviewed Fifth Columnist Member of Knesset Hanin Zoabi for the Philadelphia Bulletin. (Read it all here)...and now its on the JPost as well. 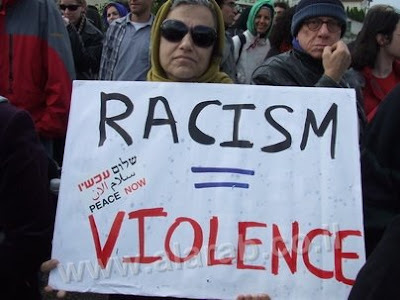 Newly elected to Knesset Zoabi thinks a nuclear Iran is a good idea to counter-balance Israel, calls Israel an "aggressor state", welcomes Iranian military support to Gaza, insists that Zionism is inherently racist, and wants to eliminate the Jewish and Zionist nature of Israel. In Chelm, they tell jokes about Israel. What started out as a roar, has died down to nothing. After Haaretz reported (and opinioned) that IDF soldiers intentionally shot and killed innocent Gazan civilians, the IDF Chief Prosecutor opened an investigation into alleged war crimes. This was blatantly obvious to me at the time, since the primary mission of Haaretz to is slander the Israel and the IDF, and with so many religious soldiers and officers, the IDF is a prime target. Till the next time (probably tomorrow). PS: Here's a good example from last week. See how Haaretz believes it's a crime against humanity for religious officers to avoid mixed swimming. The cultural elite of Israel's liberal left is so anti-religious that that they insist on forced melting pot secularization to the point that they believe letting religious soldiers NOT attend mixed swimming events is evil. One of my daughters worries a lot. Earthquakes, Tsunamis, Tornadoes, the Plague, Monsters under the bed, etc. This past Shabbat, one of the kids pulled out the weekly "Ask the Cellphone Rabbi" (SMS question and answers) list from a parsha [weekly Torah portion] sheet, and there was a question to the effect of "Do I need to be scared of spirits". The rabbi answered that he had never seen any, and regardless, there is a tradition that spirits don't abound or harm people in the Land of Israel. Much to my daughter's horror, our oldest son snarkily interjected with a Talmudic story that if you put flour on the floor around your bed when you go to sleep, you'll see chicken tracks/footprints in the flour in the morning, which prove that demons danced around your bed at night. Trying to calm my daughter, I told her that was probably from the "Talmud Bavli" -- the Babylonian Talmud, which was written outside of Israel. And besides, we have no reason to assume there are ghosts or demons lurking around...don't bother them, they won't bother you. She forgot about the ghosts and we got back to eating lunch. 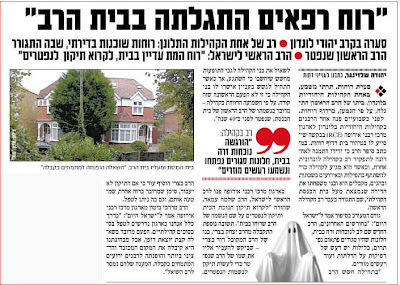 And then, the following appears exclusively in today's (Monday) Hebrew-Language Israeli newspaper Yisrael HaYom (Israel Today): "Ghost Found in Rabbi's House"
In one of the Jewish communities in London, a ghost is apparently haunting the home of a rabbi. Two weeks ago, the rabbi turned to the RCE [J@TM: Rabbinical Council of Europe] for help expunging the home from the spirit haunting it. In a letter to the RCE the rabbi wrote that his friend was recently appointed rabbi of a different community in London and when he arrived for Shabbat and Holidays with his family [J@TM: I assume, till they move in permanently] he was given the home above the community synagogue to stay in. This home is where the community's previous rabbi used to live. Someone closely involved in this episode told "Yisrael Hayom": "In the past few months, the new rabbi noticed a "strange presence" in the house, closed windows would suddenly open and at nights there would be knocks on doors and other weird sounds." At first, the Rabbi was concerned about asking his community about the phenomena worried they would assume he had gone mad. Yet when he carefully asked about the subject, other community members verified his suspicions and he was not the first to raise such complaints about the house. According to the rumors, it was the spirit of the first rabbi of the synagogue, who died 40 years ago." 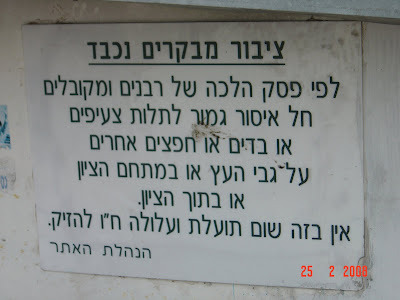 The RCE went to Israel's Chief Rabbinate -- and the Sephardi Chief Rabbi, R' Shlomo Amar advised them to "read the "Chanukat Habayit prayer [J@TM: for entering a new home], and a "Tikun" [J@TM: Kabbalistic prayer for "corrections'"] on behalf of the dead, in memory of the Rabbi who used to live at the house. 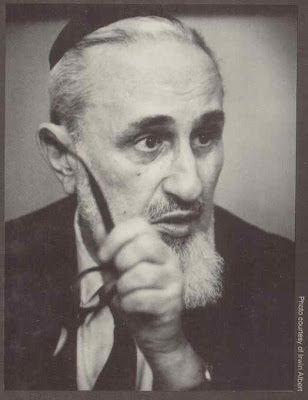 An additional suggestion came from R' Yitzchak Batzri, one of Israel's noted Kabbalists of today, who asked to give him the name of the deceased rabbi so he could personally conduct a "Tikkun" prayer. 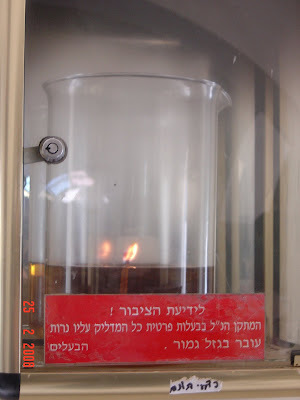 R' Batzri added that if the "Tikkun" did not work, it was a sign that the spirit haunting the house was that of someone else, and he would try again. "Normally, our organization deals with communal issues, yet this issue is rather extraordinary. From our perspective, this issue was received with serious respect, and it is being dealt with by Rabbis who are experts in Kabbala. The answer has been given to the Rabbi who raised the issue"
Ynetnews just picked up this story as well (but I translated more of the article than they did). Just don't tell my daughter about this. She worries more than enough. The basic package includes explanations of the security situations Israelis face, examples of different anti-Terrorist techniques, and of course the fun part - Shooting pistols and M-16s. When my wife was growing up, Pesach cleaning was often always done to the tune of this "classic" album, The Seder Paraders (hear them all here) on a vinyl LP record. Fast Forward to the 21rst century. Seems like the only motivation we can come up with for our teenagers to start seriously (helping) to clean is that if they DONT help, we'll download the Seder Paraders to their iPods. (Oh yeah, now I know where Mrs. Balabusta got her name from). The Israeli designed and manufactured "Tavor" assault rifle is continuing to make inroads within the IDF's infantry ground forces. 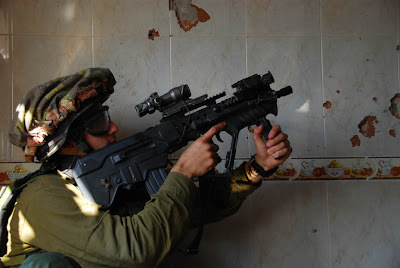 After the "Tavor" became the rifle of choice for the "Givati" and "Golani" brigades, the IDF Spokesman has confirmed that the "Nachal" Brigagde will be switching to this rifle during 2010. “The Tavor is the rifle of the future for the Infantry Corps soldiers, and we are introducing it in the compulsory and reserve units by means of an ongoing process,” explains Maj. Dudu Artzi, the Head of the Rifle Department at the Ground Forces Weaponry Unit. The Tavor, produced by Israel Weapon Industries, is shorter and more comfortable than the M-16.. The ground forces have expressed their satisfaction with the integration of the rifle in the Golani Brigade and report that the feedback from the soldiers is very positive. I'm not complaining at all about my converted M16 to M4 rifle, but if offered a Tavor, I'd happily switch. Haaretz quotes CBS on one of the previously unknown operations in the IDF's Cast-lead Gaza offensive 3 months ago. While the Prime Minister's office is refusing comment (as it should), that didn't stop past IAF commander Eitan Ben Eliyahu from heaping praise on the IAF. 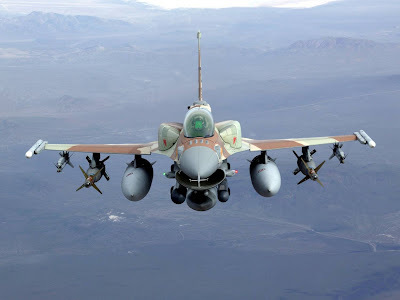 The Israel Air Force carried out an attack last January against a convoy of trucks in Sudan carrying arms for Hamas in the Gaza Strip, according to the American network CBS. According to the report, 39 people riding in 17 trucks were killed, while civilians in the area suffered injuries. Official Israeli sources refused to confirm or deny on Wednesday any report of Israel's involvement in an air strike in Sudan. However, Sudanese State Minister for Highways Mabrouk Mubarak Saleem was quoted in the Paris-based Sudan Tribune Web site as saying that a "major power bombed small trucks carrying arms, burning all of them." The strike "killed Sudanese, Eritreans and Ethiopians, and injured others," Saleem added. CBS News national security correspondent David Martin broke the story. He says that Israeli intelligence learned of plans to move weapons through Sudan, north toward Egypt and then via the Sinai into the Gaza Strip. During the final days of the Israeli offensive against Hamas, Foreign Minister Tzipi Livni and her American counterpart Condoleezza Rice signed a security-intelligence memorandum on intensifying cooperation in a joint effort to block the smuggling of arms from Iran to Hamas via Sudan. The Sudanese news site said the attack took place "in a desert area northwest of Port Sudan city, near Mount al-Sha'anun." Driving to work this morning, I heard MK [Likud] Dr. Yuval Steinetz on IDF (Galei Tzahal) radio, saying how Netanyahu wants as wide a coalition as possible, including Labor and Kadima. I laughed out loud hearing this, as its so obviously a "spin" and has nothing to do with reality. Both Labor and Likud despise the Kadima party. Their shared antagonism is based on individual issues, but its useful for these 2 parties to work towards a common goal -- the destruction of Kadima. Kadima was born out of Arik Sharon's refusal to accept the democratic decision of the Likud membership's rejection of the "Disengagement." Sharon brought the Disengagement to a vote of the entire membership, not only the "Central Committee", and promised to adhere to their decision. Sharon blatantly ignored the vote's outcome, "Disengaged" from Gaza, formed the Kadima party, and bolted from the Likud, taking many Likud leaders with him, including Olmert, Livni, HaNegbi, Mofaz, Hischenson, and others. Absent of ideology and created as a "centrist" party, many disenfranchised Likud voters moved towards the Kadima party. From the Left, Kadima also drew from the Labor party, including Peres, Itzik, Ramon, and Labor party voters have also moved in the direction of Kadima, shrinking the Labor party. So while Steinetz may issues spins that the Likud wants a government with Livni, nothing could be farther from the truth. Prior to the election, Dr. Benny Begin gave an interview on the radio (also IDF radio) urging people to vote Likud. He said if you feel you must vote for a party to the left of the Likud, he suggested "voting for a party with a well founded ideology". MK Shellly Yechimovitch [Labor] spoke right after Begin on the same program, where I have never heard nicer things from her about the Likud. She echoed Begin's comments, "if you vote for a party to the right of Labor, please don't vote Kadima, but for a serious party, like the Likud." 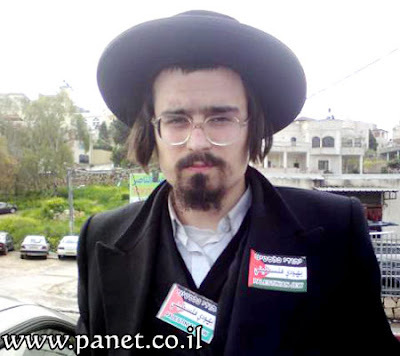 Today, MK Tzippy Hotebelli said "Kadima is the ultimate expression of opportunism. One should never forget their responsibility for the Disengagement, the second war in Lebanon, and the [political and strategic] failures of the Cast Lead operation which did not end as it should have." Note: Yet another rocket was launched from Gaza at Israel around 11:40 AM this morning towards the Sdot Negev region. No damage or injuries were reported. While I'm not thrilled about Labor joining the government, I'd be much more disgusted if Kadima had joined. This Passover, treat your guests with Passover Cake & Desserts, thank your host with a Passover Gift Baskets and delight your kids with Passover Candy or with Passover Chocolate. All from Oh! Nuts. As the leading source for kosher candy, chocolates, nuts and gifts, Oh! Nuts is fully stocked with all your Passover Food and Passover Seder needs. Please Note: From April 8 - April 16, Oh! Nuts will not be shipping out items not labeled as "Kosher for Passover". Please plan accordingly. Orders for Passover items received by 1 PM will ship out as usual. Orders for Passover items received After 1 PM will ship out Monday, April 13. Other orders will ship out beginning Friday, April 17. Orders for Passover items will ship out Monday, April 13. Other orders will ship out beginning Friday, April 17. Orders for Passover items will ship out as usual. Other orders will ship out beginning Friday, April 17. All orders will ship out beginning Friday, April 17. We resume our regular shipping schedule. You can't make up the news - real life is so much more entertaining. 1. Over the years, the Muqata blog has followed all sorts of interesting items sold on ebay -- including the joke offer of the entire Israeli city of Petach Tikva. 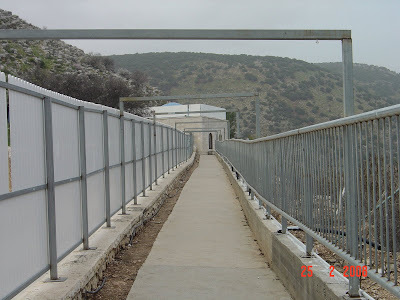 However, a synagogue in Givat Shmuel (near Bnei Brak) is now seriously offering for bids on ebay the privilege to name their shul after the highest bidder, starting at $600,000. 2. Its only 2 weeks away from Birkat HaChama -- the special blessing recited only once in 28 years after the cosmic cycle of the (symbolic) approximate location of the sun at the time of creation. The NY Times even wrote about it back in April 1897...(hat-tip, R' Tzvi and DovBear). 3. 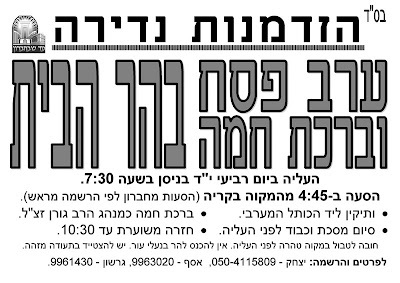 Speaking of Birkat HaChama -- for those interested, while it does occur on Erev Pesach this coming year, and Erev Pesach is always a crazy, busy day -- a group of people are arranging the recital of Birkat HaChama on Har Habayit -- the Temple Mount (after ritual purification in a mikva, of course). Unique Experience -- Erev Pesach and Birkat HaChama on Har Habayit (Temple Mount). Going up on Wednesday, 14th of Nissam at 7:30 AM. 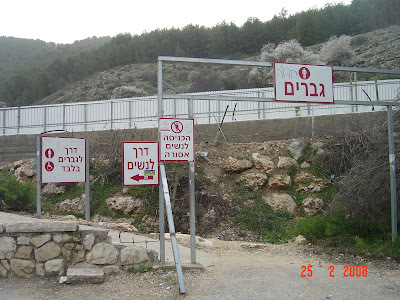 + [Bus and cars] Leaving from the Mikva in Kiryat Arba/Hevron at 4:45 AM. + "Vatikin" (Early Morning Prayers) at the Kotel/Western Wall. + "Siyum" (Finishing a tractate of Talmud), breaking the "Fast of the First Born", and food before going to the Temple Mount. + "Birkat HaChama" according to the custom of Rav Goren. Mandatory: One must go to the mikva before going to Har Habayit. One must not go to the Temple Mount with leather shoes. One must come with identification. 4. Has it really been 3 years since I wrote this? Its all about the differences between men and women (Mars and Venus) about how they approach Pesach cleaning. Worth a read -- nothing has changed since then either, except I've started doing Pesach shopping. Lots of news happening in Israel today. We will be dedicating this post to all the news that you need to know from Israel today. 11:30 PM Overheard in the Likud corridors: In order to be a government minister, one needs to move over to Labor. Many Likud MKs afraid to speak out loud in order to not lose their dwindling chance at a ministerial position. 7:53 PM Labor votes to join Bibi-led coalition. Barak promises to be opposing force within the government. 5:25 PM Impressive gallery of photos from Um Al Fahm today. 4:17 PM Qassam rocket launched from Gaza -- lands just south of Ashkelon. No injuries, no damage. 11:41 AM Photos from the march today. 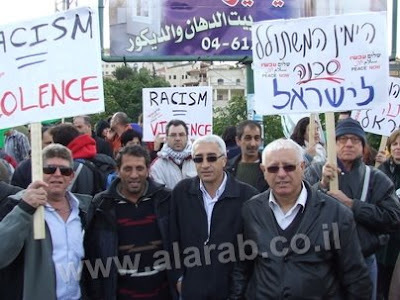 Interesting sign reads "Racism = Violence" yet the only violence came from the Arab and Leftists who pelted the police with rocks, not from the demonstrators who only marched, carrying Israeli flags through sovereign Israeli territory for 10 minutes. 10:48 AM Jewish marcher end march peacefully as expected. 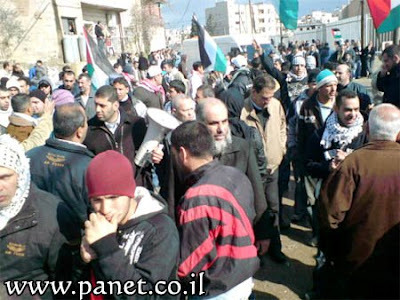 Arabs throw rocks at marchers. Police use tear gas and stun grenades to prevent escalation of Arab violence. 10:45 AM Intermittent blackouts throughout Gush Etzion. 10:12 AM Policeman stabbed by Palestinian in Tel Aviv yesterday while being apprehended in the middle of stealing a car. 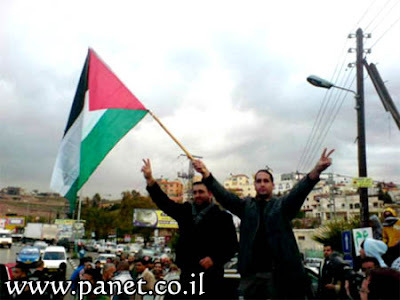 Second Palestinian escaped. 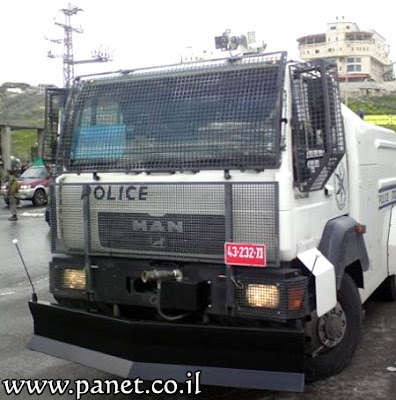 9:56 AM Rocks thrown at Israeli police at Uhm El-Fahm junction. Police arresting protesters. Situation looks like it is growing out of control. 9: 49 AM Likud and Ehud Barak's representatives in Labor sign Letter of Understanding for a coalition agreement. 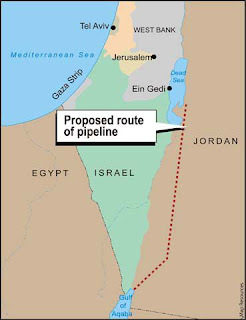 Main points include (1) the Likud agreement to uphold international political treaties signed by the State of Israel (this intentionally vague wording leaves wiggle room as the PA is not an international recognized state), (2) illegal outposts will be dismantled according to law (this intentionally vague wording leaves wiggle room as the outposts can then be legalized). This agreement will be brought to the Labor party committee for approval or rejection. Intense internal battle raging within the Labor party. Other possible outcomes include Labor party split or Barak leaving Labor and being Defense Minister independent of any party. 9:47 AM At police request, the 100 Jewish marchers have been transferred from regular buses to armored, bullet proof buses due to escalated tensions and fears that Uhm El-Fahm residents will resort to extreme violence as they announced they would. 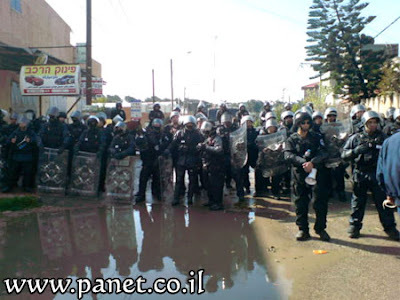 9:43 AM IDF Radio (Galei Tzahal) reports: Due to upcoming scheduled march of 100 demonstrators with Israeli flags led by National Union (Ichud Leumi) MK Dr. Michael Ben-Ari in the town of Uhn El-Fahm (Wadi Ara area), Israel's police has over 3000 border policemen and Yassam troops in anti-riot gear to provide Marcher's safety. At the Uhm El-Fahm junction (Road 65) hundreds of Arab and Leftist demonstrators are waving Palestinian flags and chanting anti-Israel rhetoric. Hundreds of Arab school children are wear kafiyah masks covering their faces and brandishing rocks in preparation for the marchers arrival. 9:40 AM At 10:00 AM today Jerusalem and surrounding areas will be testing the emergency sirens. Do Not Panic. The sirens will sound for one minute. In the event of a real emergency, the sirens will sound for more than a minute. Allegations agaisnt IDF based on rumors, not fact. Updated: In addition to my post below, the following YNET article appeared as well. There are probably thousands of furious IDF reserve soldiers who are disgusted by Haaretz's report, and the slander from an IDF NCO who wasn't even in Gaza (let alone seen battle). The reporter goes on to beat his own drum in a separate "analysis" piece entitled, "Can Israel dismiss its own troops' stories from Gaza?" The statements of the Israel Defense Forces soldiers from the Yitzhak Rabin preparatory course provide the first, uncensored look at what occurred in some of the combat units in Operation Cast Lead. It seems that what soldiers have to say is actually the way things happened in the field, most of the time. And as usual, reality is completely different from the gentler version provided by the military commanders to the public and media during the operation and after. The soldiers are not lying, for the simple reason that they have no reason to. If you read the transcript that will appear in Haaretz Friday, you will not find any judgment or boasting. This is what the soldiers, from their point of view, saw in Gaza. There is a continuity of testimony from different sectors that reflects a disturbing and depressing picture. Now, I know plenty of soldiers who saw action in Gaza during the "Cast Lead" operation, and no one that I know saw anything remotely similar to what Haaretz described. Mark my words My prediction: this entire story will turn out to be a tempest in a teapot, but the damage caused to Israel and the IDF has already been inflicted by Haaretz. I'm sure their investigative reporters are already figuring out how the IDF bakes matza with blood. Its scary. The only time before my previous Agel post that I was rather shocked at the intensity of comments left on my blog (and hate mail) was the time I posted about "Fleeing Manilla" a few years back. Philipino Hackers threatened to hack my blog, and I decided it just wasn't worth it to keep the posts up (even if they were extremely entertaining). So, before the Agel Fundies take over my blog completely, we're switching topics to something totally different. Hmmm. Katzav indicted? Nothing new there. 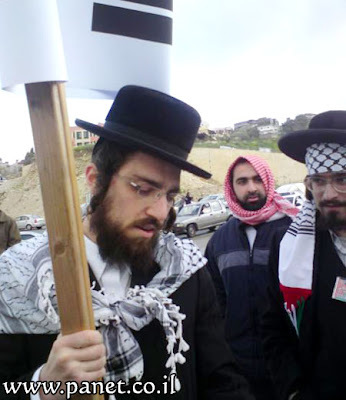 Marzel and BenGvir going to march in Um El Fahm with an Israeli flag? I'll wait till I see it happen. Ah, here we go...its not exactly MLM. Gaza: Marry a Terrorist War Widow and Win 3000 US Dollars! Hamas is offering a $3000 reward for any man willing to marry the widow of a "shahid" (a martyr), several Arab websites reported this week. Hamas initiated the move in an attempt to lower the number of widowed women in the Gaza Strip who lost the spouses who provided for them and their children, and in order to ease their emotional grief and financial difficulties. Hamas hopes that by encouraging men to wed these women, it will be providing them with stability and a better life. Stability? Better life? Don't they also encourage suicide bombers and promises of heaven? I wonder if we could get Hamas hooked on Agel. With the comments that went up about Agel taking over the Anglo communities, I was wondering to myself (as apparently were others), where are they going to find enough Anglos to keep widening the pyramid base. And then someone answered - Nefesh B'Nefesh. It makes sense. NBN might like having sponsors for flights. Agel needs buyers, and everyone knows there's no bigger buyer than a new Oleh right off the plane. NBN already has Misrad Hapnim and Misrad Haklita representatives on the flight. Now they will add Agel agents, just to save time. (Apologies to NBN, but I couldn't write this without you, and to DannyBoy and anonymous for the idea). Is there anyone on the planet who doesn't want to "get rich quick" or "work smart, not hard" and "retire in only a few years"? Chances are you'll be approached over the course of your lifetime by a representative of an "organization" that will use any of the above buzz phrases to entice you to join them in their venture to make you rich. 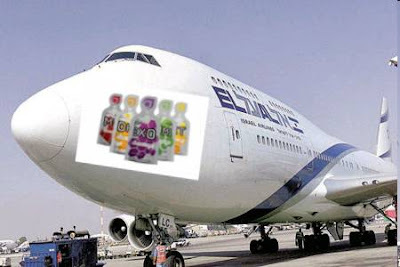 Which brings us to one of the most "popular and exciting" Trapezoidal MLM Network Marketing Opportunity in Israel today -- "Agel"
The purists will tell you that "illegal pyramid schemes" are where no goods are exchanged, so the "Agel scheme" is not illegal. It may be unethical and immoral, but it's not illegal. The question is, why does anyone need "Agel" which is sold exclusively through the Agel distribution network and not available in stores? First, what is Agel? The simple answer: vitamins in "jell" form. "If you think that this is just another scam and don't believe gelceuticals will explode in the near future then don't invest... simple as that. But the truth is they will surpass all the pills, powder supplements, shakes, etc. If you like what you hear about the product, then perhaps you should do more research instead of saying "oh it's just another scheme or scam" you and I know that it's called ignorance. Just like other pro-Agel people before me have written I challenge you to find out more about it, without saying "oh it looks like a pyramid structure it must be a scam". Predicted to be the next trillion dollar industry, AskMeWhyAgel.com Gelceuticals business opportunity is ground breaking in the marketplace by leading in an unequaled innovative revolution. Yet ask yourself, why do we really need vitamins in jell form? Is this so much more useful than regular vitamins supplements? Is Agel a better solution than healthy eating? No proof exists that gel technology is in any way better – in fact there is a greater danger of the product ingredients becoming unstable and breaking down. In Israel, this product is marketed as Kosher, and the Agel website points us to an OU kosher certification that expired a year and a half ago. Again, its important to keep in mind that not every product with an OU on it is good for you, let alone healthy. I found the following products that are also OU certified Kosher, yet I would advise you call your local poison control center if you accidentally ingested any of it. Should pregnant woman use Agel products? There are some ingredients in Agel EXO that have been listed in some texts as not appropriate for pregnant women. 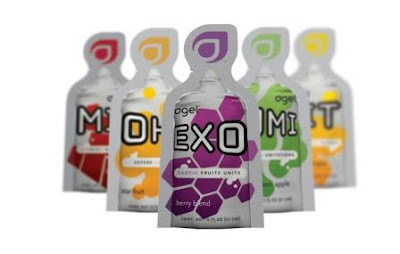 Consequently, we recommend that pregnant women not consume EXO. If you are pregnant, prior to taking any vitamin, herbs, supplements, or over-the-counter medications, we recommend that you consult with your physician. Can women take Agel products while breast-feeding? We recommend that you review the ingredients in these products with your physician prior to using them while breast-feeding. Should children use Agel MIN? As a point of reference, the American Academy of Pediatrics does not endorse vitamin supplementation in children under the age of 16, except for specific groups with chronic illnesses. Furthermore, the mineral needs of children are unclear. Should children use Agel FIT? We recommend consulting with your pediatrician about appropriate food supplementation and weight management regimens for children. As a general rule, we do not recommend diet aids for children, and we therefore do not recommend using Agel FIT in the pediatric population. We do advocate healthy eating habits and plenty of physical activity as a means for children to manage weight. To initiate an early habit of dependence on dieting aids in childhood may be sending the wrong message. Why did my skin feel hot and appear slightly red with OHM? OHM contains B3 in the form of niacinamide. It can have a flushing reaction. Sometimes the skin temporarily feels hot and gets red and sometimes a rash appears, but then disappears after a while. It is not harmful, just a bit scary if never experienced before. Can Agel products help some medical conditions? Nutritional supplements are for supplementing the diet. They are not for diagnosing, mitigating, preventing or curing any diseases. As GelDocs, it is out of the scope of our legal abilities to diagnose or make recommendations for the treatment of any disease or diagnosed medical condition. It may be out of scope for the Agel website, but the marketeers of Agel have no problem recommending agel (with official testimonials) as the miracle drug that can cure, alleviate or help: eczema, osteo-arthritis, TMJ, sinus and migraine headaches, ADHD, high cholesterol, low blood sugar, chronic fatigue, backaches, autism, those suffering from quadruple bypass heart surgery, etc. Sounds like a real miracle drug,vitamin supplement right? Except, there is absolutely zero scientific, clinical, medical documentation to back up any of these amazing claims. Its a dubious product to say the least -- yet thousands of Israelis are now actively selling agel, specifically in the religious and Chareid sectors. Some of the higher ups on the pyramid are making very nice "salaries" as a result of the work being done by their underlings. The problem with MLM and pyramid-structured schemes is that the bottom tiered people have no one available to sell on their behalf or even buy the product. There's no one left to make those at the bottom, "get rich." The charismatic, dynamic and influential people at the "top" of the pyramid are the ones making the money, while the middle and lower tiered people end up doing the hard work as they try to convince their neighbors, friends, and family that Agel is the economic and health miracle to let them live the good life. Unfortunately, Agel is not anything a family "needs", like other products sold by more reputable MLM companies such as Amway. Amway sells household goods that everyone needs; tissues, toilet paper, soap, etc. The only real selling point of Agel, is once you get past the mega hype of it being a "vitamin" -- the point of selling it is to get people to sell it on your behalf. Agel salesmen routinely advertise it as a miracle solution for the health ailments of society (like the list I provided above), learning disabilities, and more. In a country like Israel, where money is tight (and this was even before the global recession), I find it immoral for charismatic Agel salesmen to get guileful, impoverished victims to buy-in to the program with the siren song of financial independence and "easy money"
For every person making a lot of money in Agel, there are hundreds who don't. To end off -- here's a educational video from the "King of Queens" about MLM companies, and why it's common sense to avoid them like the plague. 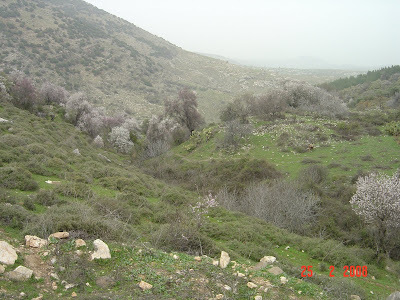 Many readers of the Muqata know that one of the topics I really enjoy blogging about is trips around Israel. While I may have not posted about these trips for a while, I have photographed many of them quite extensively over the past few years in the hope that I'd get around to eventually posting them. Today's your lucky day, as we explore the mystery of...The Underwear Tree. 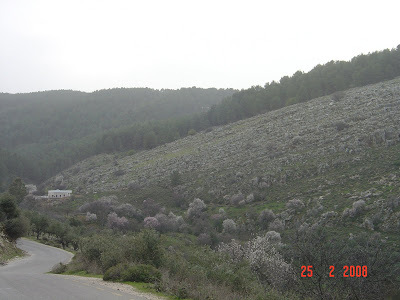 Located in the rolling hills of Northern Israel, you have to go off the beaten path for your quest of this holy tree. 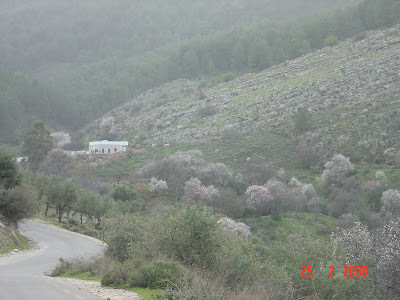 These photos were taken by me last year, as we approached the grave site of the saintly rabbi, Yonatan Ben Uziel. 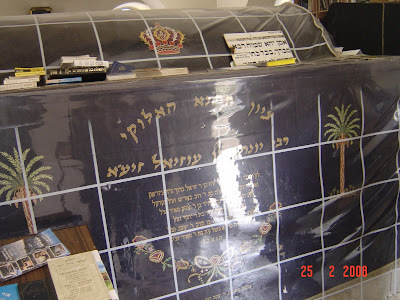 R' Yonatan ben Uziel, the greatest of the students of Hillel. Its a long, long way to the entrance...not a chance you might accidentally see a female. You enter the building and behold. 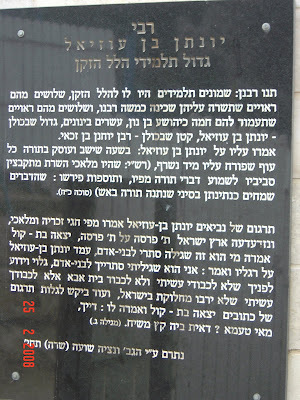 The grave marker of R' Yonatan ben Uziel. "To the attention of all: This contraption is private property. Anyone lighting candles atop of it is guilty of theft. --The Owners"
And so...the time comes to leave the building. The excitement grows, as we see the ominous sign, heralding our arrival at the hallowed spot! or within the building of the gravesite. There is no worth to it whatsoever...and it may even do harm [to you], G-d forbid. 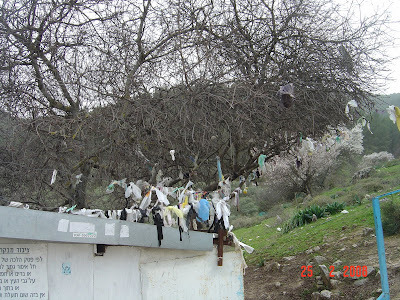 Yet that does nothing to stop women from adorning the tree with scarves, clothing or underwear -- they believe that hanging their clothes from this tree, will help them in their quest to find their shidduch, their life partner for marriage. Don't believe me? How about the NY Times? Or the ancient bloggers of yore who discussed this issue years ago when it first made headlines? And you thought I was kidding about this tree. It exists, and despite the dire warning sign, women still hang their clothes from this tree...hoping to meet their bashert, their partner for marriage. (I should mention this to Laizy Shapiro as a plot idea for a srugim episode). 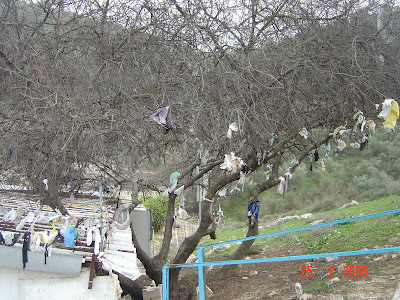 While the tree above is a totally Jewish in nature, there's also a Christian urban legend underwear tree near Laughlin, Arizona. Much less serious. That's enough for now -- Tomorrow, I shall slay the agel dragon! It is Jack. In the post below our fearless leader Jameel relinquished his iron grip upon the blog and his batter and provided us with a choice of blog topics. During a recent Purim celebration Joe Settler and I decided that the old man needs a little help around this place so we are also offering you the opportunity to provide some input on blog topics. But we are going to give you a bit more latitude and let you offer some suggestions. So here is your chance, what would you like to see us write about. Let us know and we just might make it happen. The choice is yours. First topic to get 5 votes will mean I post about it tonight.